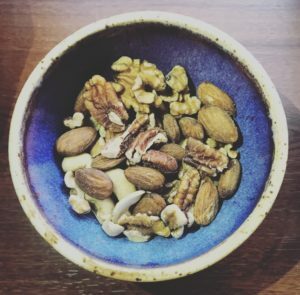 Why and How to Soak and Dehydrate Nuts, Seeds, and More! Soaking and sprouting grains, lentils, nuts, seeds and legumes makes them easier to digest and absorb. It neutralizes anti- nutrients (which impair digestion and nutrient assimilation) found in all of the above. See below for our easy prep solutions for grains, raw nuts and seeds and legumes! Soaking Solutions: 1-2 Tbsp whey, yogurt, lemon juice, or vinegar. Oats – 1 cup steel cut oats soaked in warm filtered water, ¼tsp. sea salt and soaking solution over night. Boil water (make adjustment for how much you soaked in) and cook oats for 15-20 minutes. Add butter or coconut oil once reduced to simmer! Stir every couple minutes for very creamy oatmeal. Rice – 1 cup rice soaked in warm filtered water and soaking solution for at least 7 hours. Drain, rinse for one minute until water is clear, and follow cooking directions on bag. Quinoa – 1 cup quinoa soaked in warm filtered water and soaking solution for at least 12 hours. Rinse and drain well, follow cooking directions on bag. Pecans – 4 cups raw pecans soaked in filtered water and 1 TBSP sea salt for at least 7 hours. Drain and rinse in colander. Spread pecans on dehydrator trays and place in dehydrator at 115 degrees for 24 hours. If you don’t have a dehydrator, place in oven on stainless steel baking tray at 150 degrees for 12 – 24 hours. Almonds – Follow directions for pecans. The time for dehydrating almonds is recommended for 24 hours to 36 hours. Pumpkin seeds – Same directions as pecans. Vary amount as you like, and only keep in oven for 12 hours. Popcorn – Heat 3 Tbs. coconut oil in medium size heavy pot. Poor in organic white popcorn kernels to cover bottom of the pot – one layer of kernels and not more. Shake around to ensure full oil coverage of each kernel – make sure the kernels are swimming in coconut oil! Once popping starts, reduce heat and continue shaking until you hear the popping diminish – don’t wait until you smell the scent of burnt popcorn. Transfer to a bowl and shake with sea salt. Add melted butter, if you wish. 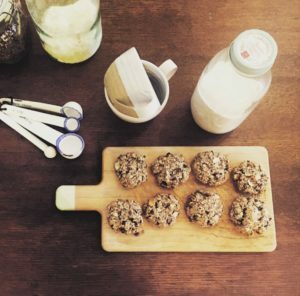 Nut butter – take 2 cups of soaked and dehydrated nuts, and place them in a food processor with 1 tsp. sea salt and grind to a fine powder. Next, add ¾ cup coconut oil (warmed to liquid is easiest) and 2 Tbs. raw honey until butter becomes smooth. Lentils – measure out lentils, soak in warm water. Stir in soaking solution, and let sit in a warm place for about 7 hours. Drain and rinse, follow directions on box. 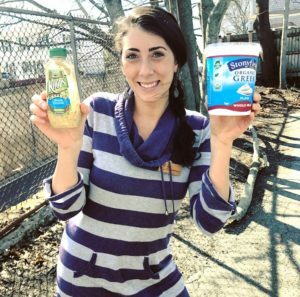 Sprouts – To properly sprout grains, beans, nuts, lentils and seeds, all you’ll need is: a quart size mason jar, a “sprouting screen” available at most health food stores, and filtered water. Fill jar 1/3 full with any grain or seed. Add filtered water to the top of the jar, screw cap on with screen. Allow for soaking overnight, rinse in the morning (with the screen still on) and drain at an angle until you rinse again. Length of time varies based on each item, so please refer to Nourishing Traditions for full preparation details. Grains (wheat, barley & rye) – rinse 2-3 times per day. Sprouts are tiny and white and will be ready in 3-4 days, reaching a maximum length of ¼ in. Beans (mung & adzuki) – Fill jar only ¼ full. Rinse 4 or more times per day. Sprouts will be ready in 4 days. Mung – 2 inch sprouts, Adzuki – 1 inch sprout. Almonds – Use whole or skinless almonds. Rinse 3 times per day. Sprout is tiny, approximately 1/8 inch. Lentils – Rinse 3 times per day. 2-3 days until sprout is about ¼ inch long. Pumpkin seeds – Use hulled seeds. Rinse 3 times per day and sprout for about 3 days until sprout is ¼ inch long. Sesame seeds – Use unhulled sesame seeds. Rinse 4 times daily. Tiny sprouts are ready in 2 to 3 days. *Please refer to Nourishing Tradition for suggestions on how to cook with your sprouts, proper storage and for freshness dates. Purchase whole milk yogurt at a local farm or grocery store. Pour yogurt into a cheese cloth and let strain over night. The result – thick “greek style” yogurt and whey. Enjoy the yogurt as is, and use the whey as we have recommended above. Make kefir and you’ll have an abundance of whey. When shopping for mozzarella, save the yellow liquid that the mozzarella balls are kept fresh in – that’s (usually) whey! The majority of the resources found on these pages come from Nourishing Traditions Cookbook, by Sally Fallon. In mixing bowl, combine Celtic sea salt, cumin, paprika, and garlic powder. Toss wings in melted ghee and then coat with spices. Grill Wings on greased stove grill top, flipping until fully cooked. 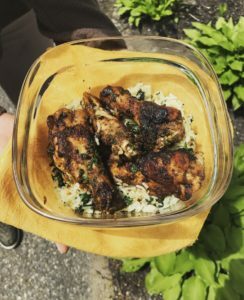 Combine melted butter, chopped cilantro, Celtic sea salt, and lime zest in a mixing bowl and toss cooked wings in mixture. *Also can just use ghee in this recipe for a Paleo version! New Market Basket Find: B-Tea Raw & Organic Kombucha! 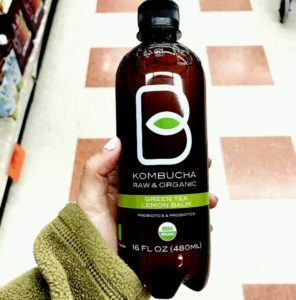 New Market Basket find, B-Tea Organic Kombucha! This was found at Westgate Market Place in Haverhill,MA so keep an eye out at your local store. Discover more foods we recommend at Market Basket by taking our Quick Start program coming up on either Thursday May 11th or June 22nd from 9:00am-12:00pm. Please call the office if you would like to sign up! You can check out our other classes by clicking here. We are exposed to Electromagnetic Radiation from electronic devices including but not limited to cellphones, laptops, and tablets. 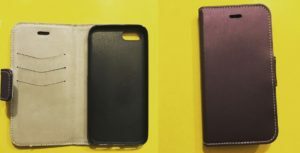 Pictured here is Kaylie’s Defender Shield which allows her to use her phone while being protected from harmful EMF radiation. For more information on Defender Shield and to view more of their products Click Here! Ghee is clarified butter. It is traditionally used in cultures around the world for cooking and baking. Butter can be used for cooking very effectively. However, small amounts of whey in the butter can often burn. Whey also contains lactose and some milk proteins, which some people react to. Ghee on the other hand does not contain any whey, milk protein, or lactose at all. It only contains milk fat, which has a higher smoke point so it does not burn. We also believe that Ghee is a very gut healing nutritious fat to add into the diet. 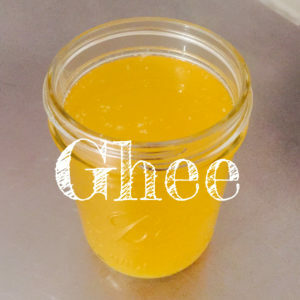 Here are two simple ways to make ghee below! Place the butter in a medium-sized heavy weight saucepan, and melt it slowly over low heat. Allow the butter to simmer and the milk solids will begin to float and become foamy at the top of the oil. Allow these milk solids to continue to cook slowly until they become browned and begin to sink to the bottom of the pan. When there is no longer any material waiting to brown and sink to the bottom of the oil, the ghee is done. Pour it through a cheese cloth/nut-milk bag to strain out the browned milk solids. Allow to cool then poor the ghee into glass jars that you will store it in. Store these jars in the refrigerator for up to a month. Take out the butter and skim any white solids off the top. Carefully spoon or pour the golden fat from the top making sure that the white liquid at the bottom** stays in the pan. Discard the white liquid (milk solids) and store the ghee in glass jars and refrigerate. ** With some varieties of butter the milk solids will float to the top. If this happens, put the dish in the fridge. As it cools down the ghee will become solid and you will be able to pour the liquid off and wipe the rest of it with a paper towel. 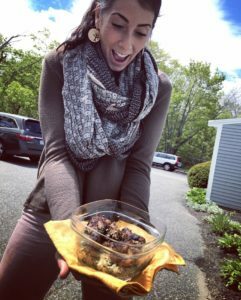 Allie showcasing some of our favorite staples from Market Basket, Stonyfield Organic Whole Fat Greek yogurt and Organic Koop’s Mustard! Join us to find out what products to buy and where at our upcoming Quick Start Program on Thursday March 23rd from at 9:00-12pm, or our Market Basket Shopping Tour on Wednesday March 29th at 5:00-6:30pm! For more info on these classes and other classes we offer, Click Here! Many people think that bottled water is the way to go, however many brands of bottled water contain nothing more than tap water. In addition to pollutants in the tap water, you are also drinking chemicals leeching from the plastic bottles. For a built in Reverse Osmosis filter we recommend Radiant Life water filter system, which uses a 14 stage process that removes fluoride, lead, chlorine, MTBE, chromium-6, nitrates, pesticides, pharmaceutical residues, water-borne illness and also adds the minerals back in that are lost during this process. 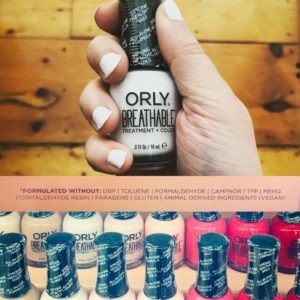 This Orly Breathable** nail polish is a great find that is not filled with many of the common chemicals, which also act as endocrine disruptors. Some of the most toxic chemicals that you want to try to avoid are Dibutyl phthalate (DBP), Toulene, Formaldehyde and Formaldehyde resin, Camphor, and Triphenyl phosphate (TPT). Also if you are looking to get pampered with a professional non-toxic mani or pedi, check out JaneGee in Portsmouth, NH! **So far we have only found this specific Orly nail polish to be free of the toxic chemicals, not all products from Orly. 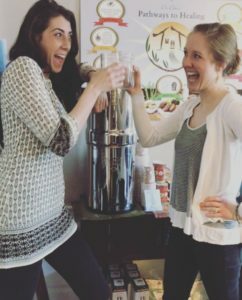 Golden milk is our favorite new beverage! It warms the soul and nourishes in a way that tea and coffee do not. 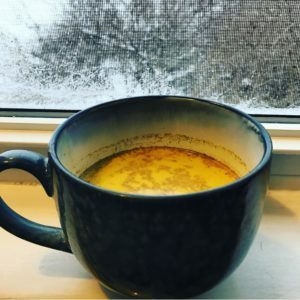 Golden milk is an ayurvedic beverage that is soothing, healing, and a great way to get your daily dose of anti-inflammatory turmeric. There are many different variations you will see online – this is our basic recipe. 1 tsp freshly grated turmeric root. If you don’t have access to turmeric root, use a high quality organic turmeric powder. Combine all ingredients in a small pot over medium heat and whisk to mix well. Once warm, you can drink it immediately. BONUS: To make the drink “frothy,” pour warm mixture into blender and blend for 30 seconds (hint: remove peppercorns before blending).